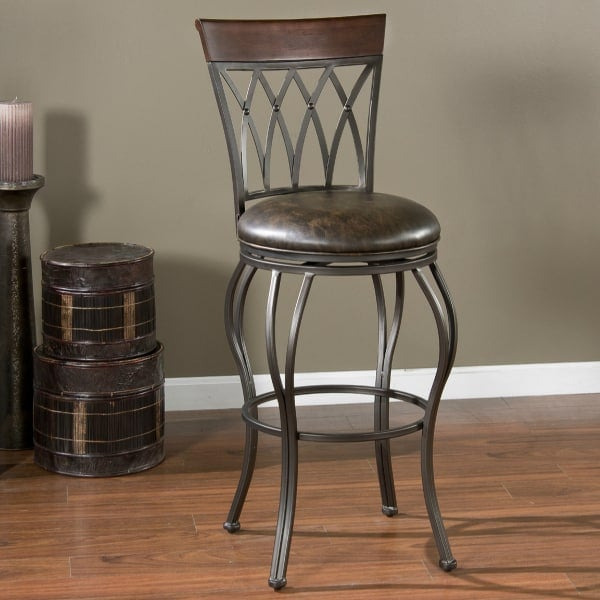 The Best Kitchen Stools - Elegant with Comfortable Leather - Free Shipping! The Palermo Counter Stool by American Heritage is as captivating and full of “la vita” as the city for which it is named. The Palermo Counter Stool features a simple yet sophisticated gothic-style back highlighted by a smooth wooden top rail; it rests on a nicely curved and balanced base. The Palermo Counter Stool is finished in a delicious pepper and has a contrasting tobacco bonded leather upholstered cushion. The cushioned seat is not only attractive; it is extra thick and comfortable. The Palermo Counter Stool has a full-bearing 360 degree swivel function, making it a perfect stool for using with a counter or kitchen island. Adjustable leg levelers ensure the Palermo will sit levelly on any flooring.